Dark Skies holiday accommodation, just minutes from Galloway Forest Park, Dark Sky Park, Dumfries and Galloway. 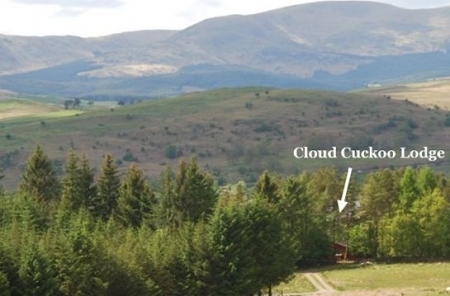 A romantic, Scottish, honeymoon, log cabin hideaway? A base to explore Galloway and it's spectacular scenery and wildlife? A peaceful country cabin, holiday retreat - maybe for a special celebration? The freedom of self-catering accommodation? Dark Skies accommodation,very near Galloway Forest Park? 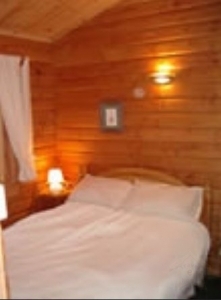 Then come and stay in the seclusion, warmth and comfort, with a touch of luxury, in our delightful log cabin. The vacation rental cabin is lavishly equipped with tv, dvd, video and tape/cd player together with a wide selection of viewing and listening materials and has a wood burning stove, electric heating and double glazing for cozy winter breaks. This is a single, detached holiday cabin for short term rental, within it's own fenced land. It is not on a site and is situated on one side of a picturesque valley, ideal for discovering Galloway and South West Scotland. This is a quiet, rural location, with stunning views. We confirm booking and send travel directions upon receipt of payment. Cheques should be made payable to "John Wykes". Arrival and departure times are not important unless others are leaving or arriving on the same day. In that case we would ask that you arrive after 4:00 pm and depart by 10:00 am. Cancellation: If unforeseen circumstances require you to cancel within two weeks of start, then 50% of the total cost will be payable unless we are able to re-let.